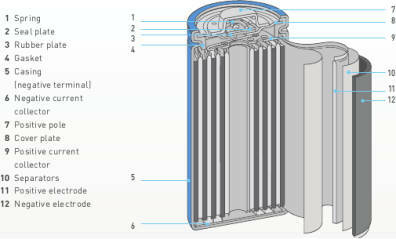 These basic Nickel-Cadmium battery types are characterised by their high capacity and good performance per cost unit. 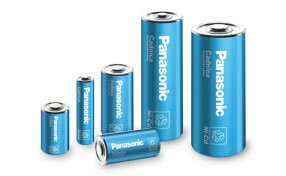 These Panasonic Cadnica batteries are ready-charger in just one hour. During charging, the sharp temperature rise of the batteries makes it easy to detect where to cut off the charging process. Models BK-65AAAB and BK-80AAAB are compatible with consumer AAA size. Models BK-110AAB and BK-200AAB are compatible with consumer AA size. These high temperature batteries offer excellent charge efficiency and long service life under severe temperature conditions. Emergency lighting devices, for example, can be powered for approx. four to six year. These Panasonic Ni-Cd batteries are designed for superior durability under severe rapid-charge conditions at temperature as high as 70°C. For high power use application such as power tools. This Cadnica battery series was developed by improving upon the standard Ni-Cd long-life series. This superior batteries are suitable for back-up applications where both high power and heat resistance are critical. 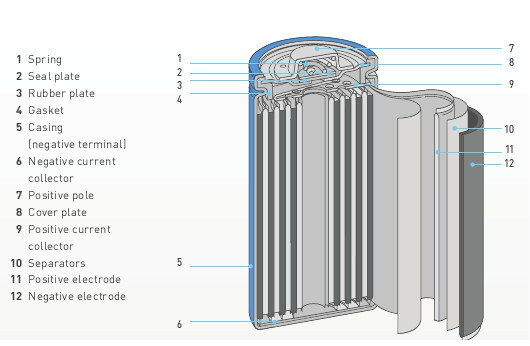 The illustration shows only one example of a Ni-Cd battery structure.